in microwave, about 2 minutes. Stir to insure it has all melted. Pour melted ingredients over saltines. Spread over all crackers as best you can with knife. Bake for 10 minutes. Remove. 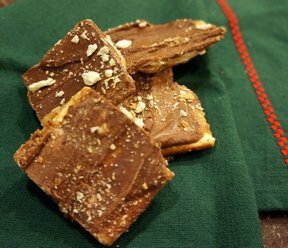 Pour semi-sweet chocolate chips over hot crackers. No set amount of chips, I use about half a bag per sleeve of crackers. Place back in oven for 2 minutes. 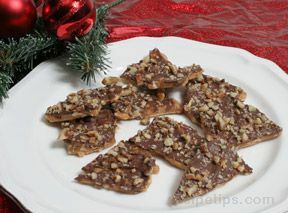 Remove from oven and spread melted chocolate over crackers with knife. 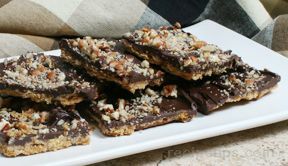 Sprinkle with chopped nuts. Let cool and break apart.